Under eye dark circles and blemishes are often my biggest challenge when trying to create a flawless skin base. With many drugstore brands increasing the costs of their products, camouflaging those pesky pimples and sleepless nights that come with the stress of being a student is becoming increasingly harsh on every makeup lover’s pockets. Thankfully, Collection 2000 has provided the solution everyone has been waiting for: An extremely affordable, high coverage, creamy concealer. 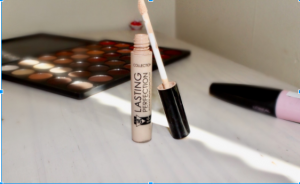 Priced at €5.79, this Collection 2000 Lasting Perfection Concealer provides 16 hours of coverage. After foundation, apply some on the desirable area, blend with a beauty blender or concealer brush, set with powder, and you’re good to go. Available from Boots in shades Fair, Cool Medium, Warm Medium, and Dark, it suits a large range of skintones for a very small price. It is these characteristics that have vastly lead this concealer to become a beauty cult favourite. Sleek has answered our highlight prayers! Sleek’s Solstice Highlighting Palette consists of four shades that cater to a variety of skintones. One shade, Ecliptic, is a buildable lavender cream highlight, while the rest (Hemisphere, Subsolar and Equinox) are a blendable powder. 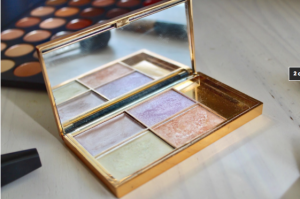 This highlight palette is more for those who seek an obvious, bright glow on the face that lasts for hours, while also providing for those who want a more sheer highlight with Ecliptic. Placed on top the cheekbones and other areas you wish to accentuate; such as the middle of the nose, the cupid’s bow, and the inner corner of the eye, this highlight almost gleams in the dark. In particular, ‘Equinox’ which is sat in the right hand bottom corner of the palette caused an online frenzy amongst the beauty community due to its vibrant, near- blinding highlighting power. It is the most pigmented shade out of the four, and leaves a copper, metallic finish without emphasising the pores. All shades blend seamlessly into the skin. Overall, this budget highlighter can compete with many high end highlighters, but for quarter of the price. L’Oreal Paris Miss Baby Roll Mascara, €10.49. Fake eyelashes without the stress of putting on actual fake lashes? Yes please! 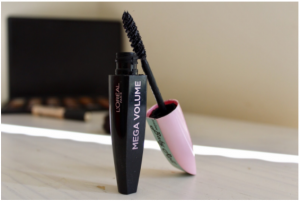 L’Oreal Paris’ new Mascara claims to provide a major curl, with volume, that will last all day long and I can confirm that it does just that. It comes in five shades – Black, Black Waterproof, and Indigo, Teal and Lilac for the more adventurous buyer who wants to switch things up. This mascara removes the need to curl your lashes before applying your mascara as it transforms your lashes with just one to two applications, so one tube lasts a long time. So forget eyelash extensions and try this mascara instead, you will not be disappointed.